Delivered to U.S. Army Air Force as 44-63615, 19??. Delivered to FA Uraguaya as FAU 270, 1950. - Displayed at Carrasco AB, Uraguaya. Joseph Kasparoff, Montebello, CA, 1984-1990. - Restoration to static display, 1987. 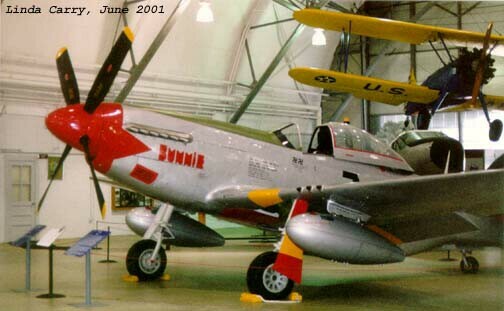 - Displayed as tuskegee airman P-51, Tuskegee Foundation, by 1989. Ascher Ward, Sepulveda, CA, 1993. ILOC Corp, FL, May 2, 1994. Air Mobility Command Museum, Dover AFB, MD, 1995-2003. - Displayed as Bunnie/Miss Kentucky State.